Limerick is the capital of Ireland's Mid-West region with an urban and hinterland population of over 200,000 and is noted for its shopping, its dining and entertainment, its historical significance, as well as its contributions to the arts. Limerick has something to offer everybody thanks to its many cultural, historical, architectural, sporting, shopping and business activities. With almost 50 per cent of Limerick's population under the age of 30, it is a vibrant, living, cosmopolitan city. The official Tourist Information office and website can provide a wealth of useful information about what to see and do in Limerick, accommodation, transport and much more. Details are on our general information page. The surrounding area of Limerick County is a place of rural charm and great beauty, with a gently undulating landscape that varies from the mountains of Ballyhoura in the Golden Vale to the Shannon Estuary. For places to visit in counties Limerick, Clare and Kerry, please see our sightseeing pages. As a visitor to Limerick City you will have no problem finding things to see and do. The historic natures of Ireland's third largest city, and indeed the beautiful nature of its surroundings, provide many areas of interest. 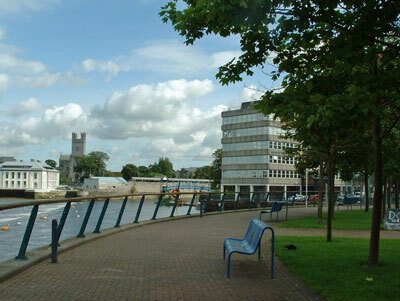 This page provides a selection of places to visit in the City of Limerick. For more information about Limerick and what's on visit www.limerick.ie. For information on the surrounding area see our sightseeing page. King John's Castle, on the south side of Thomond Bridge head, built in 1210 to dominate the bridge and watch towards Thomond, is one of the finest specimens of fortified Norman architecture in Ireland. The castle is roughly square on plan and its 60 meter frontage along the river is flanked by two massive round towers, each over 15 metres in diameter with walls 3 metres thick. The tower nearest the Bridge, the first portion of the castle to be erected, still bears the scars of the besieging cannon of 1691. Eastwards of this tower, in the north wall, is the castle gate entrance - a tall, narrow gateway between two tall, round towers. There is another massive round tower at the north east corner of the fortification, but the east wall and the square tower defending the south-east corner of the castle, and on which cannons were mounted, were long ago demolished. On the three land sides, the castle was protected by a deep, broad moat, fed with water from the river Shannon. Only the narrow drawbridge to the castle gate gave admittance. There were military barracks erected within the walls in 1751, some of which still remain. Houses were also erected in the castle yard at a much later date. The walls and towers still remaining are in a reasonably good state of preservation, and work is continuing to improve their condition. Some of the rooms in the tower blocks are being brought back into use. More information is available on the St John's Castle website. At the junction of Nicholas Street and Bridge Street stands St. Mary's Cathedral, the ecclesiastical centre of the fortress for hundreds of years. The full title of this Cathedral is the 'Cathedral and Parochial Church of the Blessed Virgin Mary'. It was built in 1172 by Donal Mor O'Brien, the last King of Munster. The original plan of the church was in the form of a Latin cross. Additions were made to the Cathedral, two centuries later, during the episcopate of Stephen Wall, Bishop of Limerick. At the time of the religious revolt of the sixteenth century, the Cathedral passed out of Catholic hands. Catholic worship was restored, however, during the Confederate Wars and the short ill-fated reign of James II. Visitors will find excellent documentation of historical remains within the ancient Cathedral itself. Most noteworthy relics of the past are the ancient altar stone used when Mass was celebrated in the Cathedral, and the splendidly carved misericords in the choir. These miserichords are unique in Ireland as the only surviving pre-Elizabethan carvings, and probably date from 1480 when Bishop Folan restored St. Mary's. Of the 21 carvings, 16 are different, representing such mediaeval emblems as a two-legged one-horned goat, a griffin, a sphinx, a wild boar, an angel, a head resembling Henry IV, a dragon biting its tail, antelopes with intertwined necks, a swan, an eagle, the Lion of Judah with a dragon, and a cockatrice holding its tail. 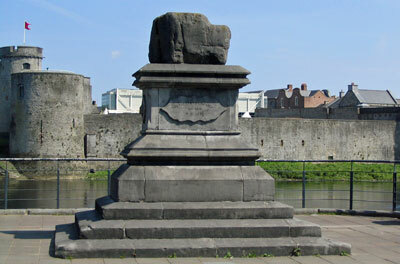 Limerick City's most famous monument, the Treaty Stone, gets its name from the tradition that the Treaty of Limerick, 3 October 1691, was signed on the stone itself. This tradition dates back at least to 1797, when John Harden of Cork mentions it in his diary, and Dr. Young, Bishop of Limerick, described it to Dr. Milner, Vicar Apostolic of London, in 1808. The stone, a block of limestone, stood outside the Black Bull public house in Thomondgate, where it was used as a step for mounting horses. In this position it was attacked by souvenir hunters, and to prevent this, a subscription was begun in 1863, which resulted in its erection onto a pedestal opposite its former position, in 1865. The Treaty Stone bears little resemblance to its former shape, in fact it is little more than half its original size; the missing parts are dispersed all over the United States and Canada in tiny chips. The stone was moved once again in 1990 due to the proximity to the corner of Thomond Bridge and the busy traffic from High Road, raising fears that the stone and pedestal may have caused the road to collapse and cave in. The stone and pedestal were moved only a few metres and are still located in Clancy's Strand, within walking distance of Thomond Bridge. More information about the Treaty Stone is available here. 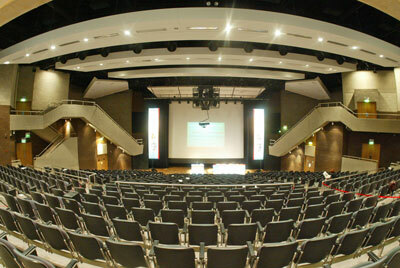 The University Concert Hall (UCH), is a 1,000 seat, multi-purpose venue and the first purpose-built concert hall in the country. Since its establishment in 1993, UCH has served as a multi-cultural facility for the Mid-West Region and beyond with over 1.4 million audience members attending concert performances spanning all genres of music together with performances of dance, ballet, musicals, drama, comedy and opera. Frequent television and radio broadcasts by the National broadcaster RTÉ have taken place and the venue plays host to numerous local community music and performance groups. Visit the UCH website for details of upcoming events and concerts. The Lime Tree Theatre is a state-of-the-art 510 seat theatre, situated in Mary Immaculate College in Limerick city centre. Officially opened on October 30th 2012, the venue hosts a wide range of performances, including theatre, music, comedy, traditional arts, schools' performances and conferences. Visit the Lime Tree Theatre website for details of upcoming events and concerts. 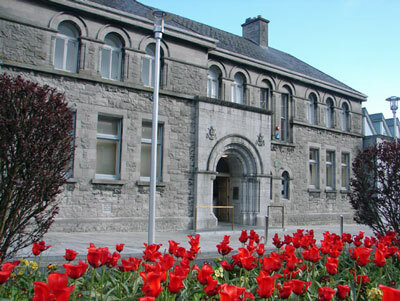 Limerick Museum is also known as the Jim Kenny Municipal Museum. It was opened to the public in 1916. In September 2012 it moved to Istabraq Hall in City Hall on a temporary basis. The Museum's collection illustrates the history of Limerick and its people. Its displays include archaeological artefacts, Limerick silver, Limerick lace, examples of local printing, cases on the struggle for independence and much more. Address: Limerick City Museum, Istabraq Hall, City Hall, Merchants Quay, Limerick. For more information see the limerick city website. To view the Museum's catalogue online, go to the museum website and choose browse or search. 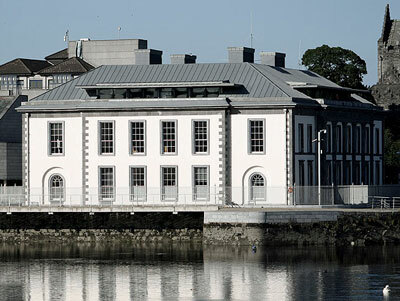 Limerick City Gallery of Art (LCGA) is one of the leading contemporary art galleries in Ireland and home to an important collection of Irish 18th to 21st century art in all media. It exhibits national and international artists annually in a diverse exhibition programme. Following a major redevelopment to the Carnegie Building on Pery Square, LCGA moved back on site and reopened to the public in January 2012. You may also visit the ZEST cafe, and the renovated galleries when you visit. Address: Limerick City Gallery of Art, Carnegie Building, Pery Square, Limerick. For more information see the city gallery website. 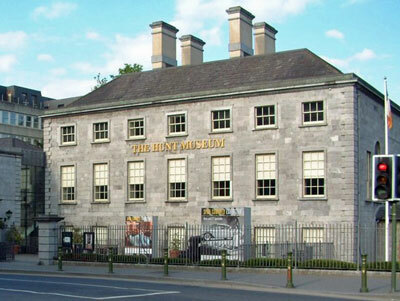 The Hunt Museum is one of Ireland's greatest private collections of art and antiquities, dating from the Neolithic to the 20th Century, including works by Renoir, Picasso and Yeats. The Hunt Museum was founded by John and Gertrude Hunt, who built up a diverse collection of antiquities and fine and decorative art. It was opened in 1997, unfortunately some years after the Hunts had passed away. 18th and 19th century decorative arts are also represented with fine examples of silver, glass and ceramics. Artists' works in the collection include Pablo Picasso, Pierre Auguste Renoir, Roderic O'Conor, Jack B. Yeats, Robert Fagan and Henry Moore. Address: Hunt Museum, Customs House, Rutland Street, Limerick. For more information see the Hunt Museum website. Walk through the most important sites depicted in Frank McCourt's best-selling autobiography, Angela's Ashes . For more information see the Discover Ireland website. For further detail see also this website. Arthur's Quay Park is situated in Limerick City Centre, opposite the Arthur's Quay Shopping Centre and on the banks of the River Shannon. It was opened on the 1st January, 1991, by Mary Robinson, former President of Ireland. The local Tourist Office is located alongside the main entrance to the park. There are excellent views of the River Shannon, Curragour Falls and Clare Hills from this park. A new weir was built in recent years to allow boats access between the Abbey River and Shannon Estuary. This weir bounds the park. A small marina is located nearby. The city riverside walk also passes through the park. While you are in Limerick you might be interested in exploring your Irish roots. Well no better place than the Irish Ancestry Research Centre (IARC) which is a leading provider of research, education and genealogy training in History of Family and Irish ancestry. The centre also provides services for local and national repositories with a particular focus on genealogical sources. It has recently located to 58 O'Connell Street, Limerick City. Please contact the centre on 061-207114/518355 for further details for research, events and educational initiatives. The IARC team of researchers and education professionals is available to you at the centre at 58 O'Connell Street. Alternatively you can browse their services online, and complete a research request for genealogical research assistance. IARC is a not-for-profit organisation,and has charitable status, established in 2011. For more information see the IARC website. Limerick has many pedestrianised and shopping areas where you can find small family shops and modern department stores catering for all your needs. The best areas for shopping in Limerick are Cruises Street, Arthurs Quay Shopping centre, Patrick Street and William St. O'Connell Street. The Milk Market, a market at the corner of Ellen Street and Wickham Street, is a great place to spend a morning wandering through the stalls. Open 10am to 3pm Fridays, 8am to 3pm Saturdays, and 11am to 3pm Sundays. The Market Quarter is an area of Limerick City that is synonymous with great nights out, and is a must visit on any trip to the Riverside City. See www.limerick.ie/visiting/foodanddrink/pubs for information about pubs in the area. The Fashion Quarter is another great area in Limerick for shipping.